Latin Fire was founded by David Flores – a major player in Texas’ Afro-Latin music scene. 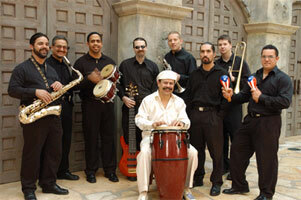 His nine piece party band delivers the hot Salsa and Latin sound party goers crave. Salsa, Merengue, Bossa Nova, Lambada, Bolero, Mambo...the band plays it all! Totally professional and experienced, the band was chosen Best Salsa Band by the Dallas Music Awards organization. In a ballroom or club, inside or out, the band’s on fire with energy and enthusiasm!